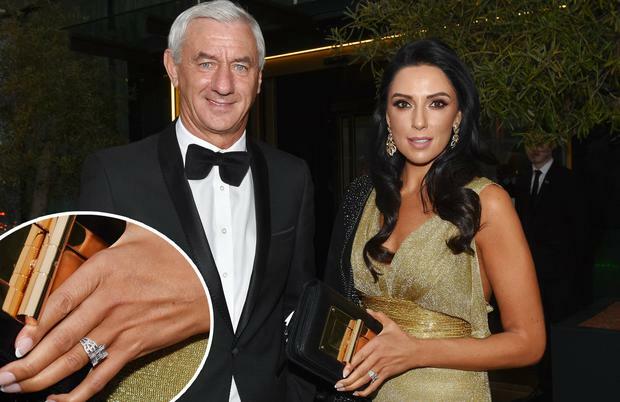 Carol Anthony has revealed her hurt over unfair reports speculating about the age-gap between her and her Liverpool legend fiance Ian Rush (57). The loved-up pair, who were at the Sean Cox fundraising dinner in Dublin last night, have been together since late 2013 and she was over the moon after the ex-striker surprised her with a proposal last month. However, the Cork-born businesswoman (40) feels some of the coverage of their engagement was less than favourable. She said she’s now taking a stand against the negativity that can surround their relationship and the 16-year age gap. “It was in a couple of the the papers in the UK, all about the age gap and didn’t come up to speed about what I’ve been doing the past few years. They took another six years out of my life. There’s 16 years between us, not 22. There’s 13 years between my own parents. “The slant they put on it was wrong, like I was marrying him for money or something. I just felt it was time I spoke up for myself,” she said. She was keen to shoot down any suggestions that she is a “gold-digger” but said that it was “normal” for people to jump to that conclusion when it comes to wealthy sports personalities and their younger partners but that their relationship was different. This will be the second marriage for both of them. “Ian himself said, It’s great to support a footballer in the height of their career but when you finish your career, it’s a downward spiral and a whole different ballgame. “I’ve been so supportive of Ian over the last year years and help him work on getting contracts so it feels a bit like a slap in the face when you read these articles. It was a little bit hurtful. She said she’s determined to be known as more than just Ian Rush’s other half and has been “grafting for years” and has had her own business since she was 19. The former model recently got into the property business in the UK and said she would love to start investing in Dublin as the economic remains bouyant. A trained singer who once toured with Westlife, she also has a huge interest in the charity sector and has been helping her other half with the Ian Rush Foundation. She flew over to Dublin this week to help present a €1.3m cheque to the Shabra Foundation, which has been working to supply genetic testing equipment in the Mater Hospital. “I campaigned for this for the past three years,” she added. She has also been invited over to Pakistan by its Prime Minister Imran Khan on Monday to visit some of the worthwhile work carried out by the Ian Rush Foundation.